The vast majority of cameras – at least, those aimed at beginners and enthusiasts – use SD-format memory cards for recording images and videos. Over the years these have evolved to meet the demands of increasingly advanced cameras, from the higher megapixel counts of sensors to faster bursts rates and 4K video recording. A consequence of this is that today’s cards bear many different indicators as to how they can be expected to perform, which can make choosing a card confusing to those unfamiliar with the terminology. We're here to demystify the process and help you find the best card for your camera, so here are the main things to consider. The first thing to look for is whether a specific card is compatible with your camera. Assuming your camera uses the SD format, it should be compatible with the two main types of cards manufactured today, namely SDHC (Secure Digital High Capacity) and SDXC (Secure Digital eXtended Capacity). Older cards that are simply marked SD will typically work with today’s cameras too, although they're no longer produced, as the demands of the latest models exceed their capabilities. The best way to check what your camera will and won’t accept is to look up the camera’s specifications in the manual (or the equivalent page on the manufacturer’s website). All SDHC and SDXC cards have a small tab at the side that prevents a card’s contents from being changed in any way – if you slide this tab down you won’t be able to record anything to or delete anything from the card, and this is a useful way to secure your images and videos, particularly once your card is full. Sometimes this tab can be moved slightly when you're inserting a card into your camera. If you get an error message when trying to take an image, take the card out and check the tab isn't in the 'locked' position. Other types of SD cards come in smaller variants, such as microSDXC. These are typically used in smartphones, although they often come with SD-sized adapters that allow them to be used in cameras and card readers. Lexar and Sandisk are the dominant players in the market, although Integral, Kingston and Transcend produce perfectly sound alternatives that may be cheaper, while there are also options from well-known brands such as Toshiba and Samsung. Whichever brand you decide to go for, only buy from a reputable seller, as there are unscrupulous outlets offering counterfeit cards. Memory cards come in a wide range of capacities, and this is reflected in their price. All cards with a capacity of 32GB and under fall into the SDHC camp, while cards sized at 64GB and over are classed as SDXC. You’ll soon be able to buy cards in the latter variety at capacities of up to 1TB – the same as a basic hard drive – although this is well beyond what most people need (and indeed, can afford). The most common types of cards are 16GB, 32GB and 64GB. How large a card you need depends on what you intend to use it for. Someone using a compact camera with a 12MP sensor, for example, should get along fine with a 16GB card if they only intend to capture JPEGs on an occasional basis. 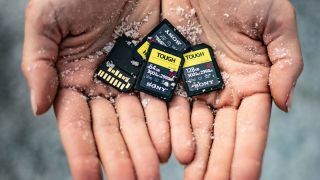 If your camera is equipped with a larger sensor, however, and you want to capture raw files, videos or many bursts of images, you're likely to find that a 16GB card fills up far too quickly. Most people find that opting for a handful of moderately sized cards is a better option than using a single larger one. This makes sense from the perspective of security – if something goes wrong with the card, for example, it’s good to know that not all your images and videos are at risk – but it’s also a good idea where organisation is concerned. An increasing number of cameras now offer two card slots, which is another reason to invest in multiple cards rather than just one.